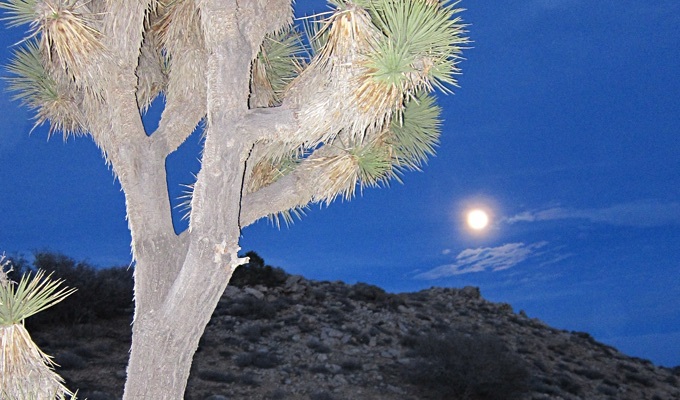 My eleven year old son, William N6WMG, and I (KX6A) were headed to Joshua Tree National Park for a Boy Scout campout and rock climbing trip. It’s a trip we’ve done before with the Troop and decided this time we’d bookend the trip with two summit activations. We choose W6/SD-039, Pt. 5540 (6 points) for late Friday before heading to our weekend campsite. Pt. 5540 is in the north-western end of the Park and is definitely off the beaten path. This is not your standard heavily trafficked tourist spot. It takes a bit of research to figure out how to get there but Dan NA6MG has posted some good directions on the SOTA site. Plan on 35 to 45 minutes drive time once you turn south off CA 62 at La Contenta Rd. You will not pass any ranger gates on the way so be sure to pick up your car pass first at the Ranger Station at 6554 Park Blvd. Once you pass Yucca Trail / Alta Loma Rd it is all dirt road. As of late January 2016 the roads are in great shape and appear to have been graded recently. I drive a 4×4 so it was quick and easy going, though you could have gotten by with a suitable clearance two wheel drive vehicle given the current road conditions. But check first – in the past I’ve heard that you need a 4×4. You don’t want to get stuck back there. To check on the current conditions ask at the ranger station for the road condition in Covington Flats. Looking at the map you want to drive up to the turn around for Eureka Peak and park. Be careful. Eureka Peak is marked on most maps and with a nice trail would appear to be the summit that you are after but the SOTA Summit SD-039 PT. 5540 is the summit just to the east of Eureka Peak. Will and I arrived and parked at the turn around just after 4:00 PM. We knew we were short on time but fortunately it is a short third of a mile hike with a moderate elevation gain of maybe 120 feet. There is no trail but it is a quick and easy cross country hike. Just plan out your route to avoid some of the desert obstacles. Just after 4:30 PM we were on the summit setting up. We found an area out of the breeze and set up our KX3. For an antenna we used a LNR Precision Trail Friendly End Fed elevated on a 20 foot sectional pole. I was able to self spot using SOTA Goat but I did have to move around the summit a bit to get a signal to send the spot. I was able to quickly log two chasers on 40 meters and then it went dead. Not sure if it was the short notice of the activation, NPOTA burnout or the hour of the day but it was slow going. It was another 15 minutes before we could get another spot out and raise some additional chasers on 20 meters. A little after 5:10PM it was starting to get dark (and cold) and while I had eked out 5 QSO’s, Will had only successfully logged 2. It was time for Plan B. We needed to get Will over the hump. Prior to heading out for the trip I had tracked down the local repeaters and programmed then into the handhelds. I had done this primarily for emergency use but it proved crucial for a successful activation. While I continued to call CQ on 20 meters Will took our Yaesu FT1D HT and tried to raise someone on the Yucca Valley W6BA repeater. I must have been beaming with pride when my son returned to tell me he had raised John KI6FKP on the repeater and that John was QSYing to 146.52 simplex to complete a QSO. Better yet, John was calling some local friends to help Will out. 5 minutes later Will had completed his activation with the help of KI6FKP, AI6AF and N6GIW on 2 meter simplex. I can’t thank the local hams enough. They saved the day. After completing our activation we packed up and hiked out using our headlamps to light the way. The moon was already up in the sky. 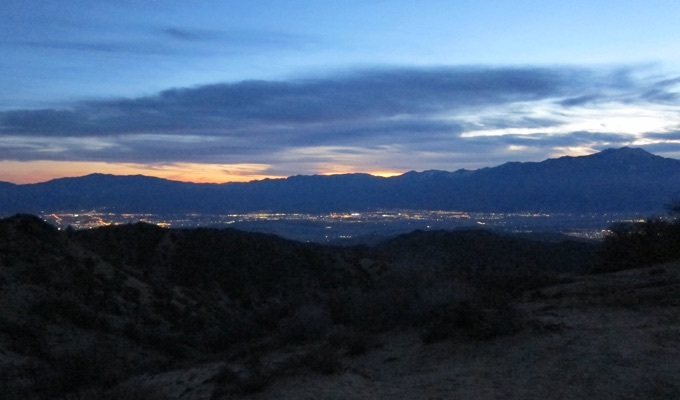 Once back at the parking area there are great views of Palm Springs and San Jacinto (W6/CT-002). It was a great way to start the weekend trip. 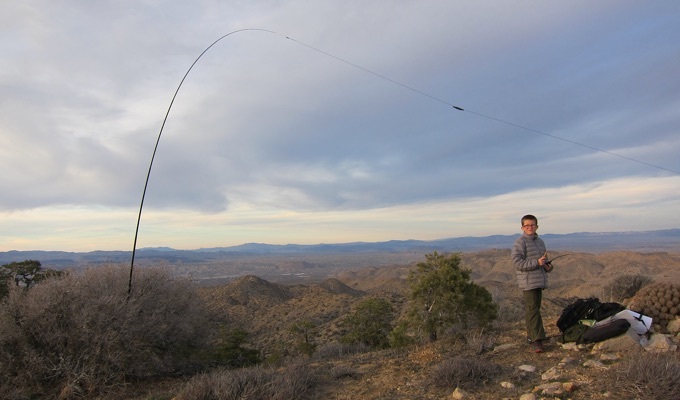 We learned some valuable lessons and on the drive back out to our Troop’s campsite for the weekend we came up with a much better plan of attack for our next activation on Sunday afternoon: W6/SD-044, Pt. 5352. 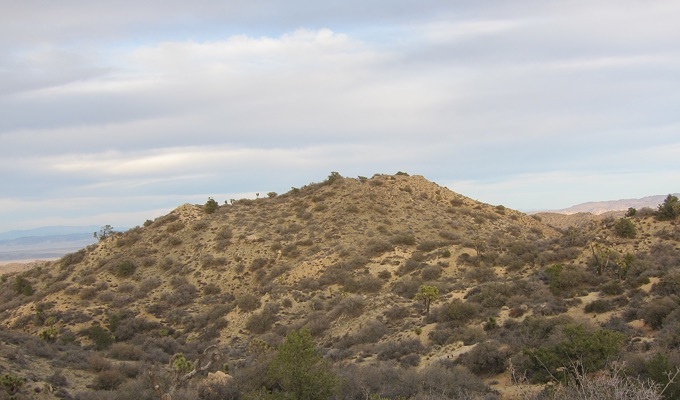 If you are looking for a relatively quick summit while in Joshua Tree National Park this is one to consider. If you have a bit more time and like to hike short steep terrain add W6/SD-044. 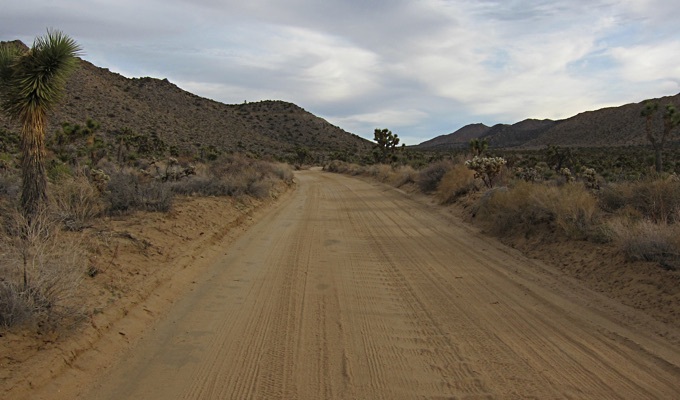 To compliment NA6MG’s directions I’ve marked the dirt road back to W6/SD-039 & W6/SD-044 on CalTopo.